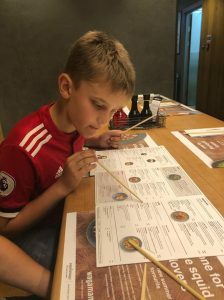 Its so hard to know what to buy for Harry when it comes to birthdays and I recently blogged about tips for other people who might not know what to buy for the child who literally wants nothing because I know what a challenge it is. 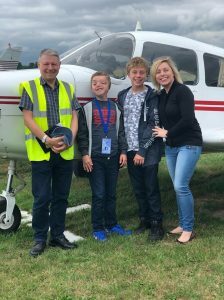 So when I saw a post in a group I am a part of which recommended a flying day for children with disabilities I took a look. 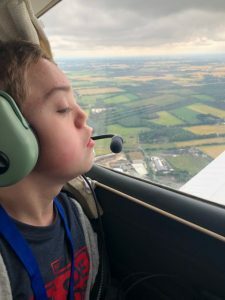 Its easier to pacify Harry with remote controls and Vtech toys but I want more for him so I was excited to find out that I could apply for him to have a trip up in a light aircraft over Manchester. I knew he wouldn’t be too interested when I told him on his birthday but equally I knew he would enjoy the experience so I applied and we were allocated a place for an afternoon ride one Saturday. The day itself is run by the Douglas Bader Foundation and we had a welcome pack with some really interesting information about the name sake of the charity. Sir Douglas Bader gained fame as fighter ace and leader during World War 2, recognition that he achieved despite loosing both of his legs in a flying accident in 1931! However, it was for his inspirational work amongst the disabled community throughout the UK that Douglas was knighted in 1976 and it is this work that the charity, established immediately following Douglas death in 1982 by his family and closest friends, seeks to replicate. What an incredible legacy! Our welcome bag also included wrist bands and t-shirts for all four children as well as food vouchers for the on site cafe which I didn’t expect and was really touched by. We had eaten before our visit so we only used a couple of the vouchers for drinks and crisps and handed the rest back knowing how hard it is to secure funding as a charity. The flight itself was brilliant. 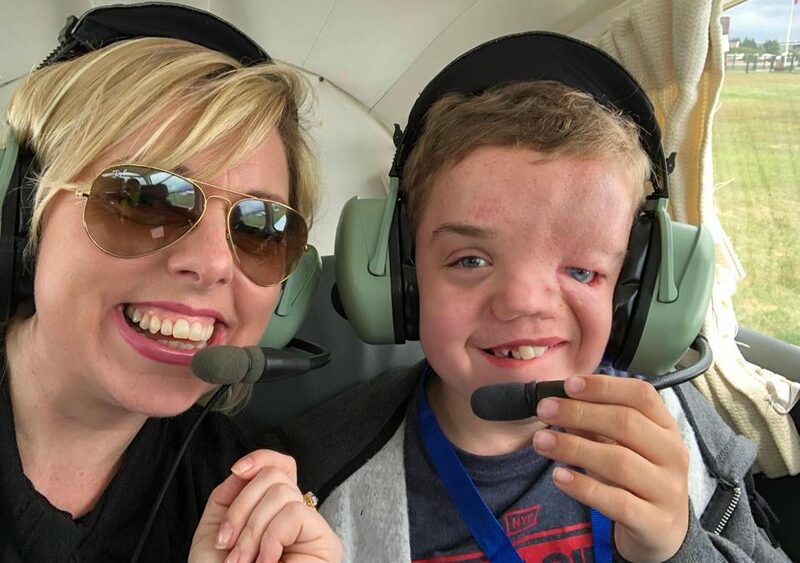 Harry was smiling from the minute the engines roared into action and the aircraft started to vibrate as that really fed the sensory seeker in him. 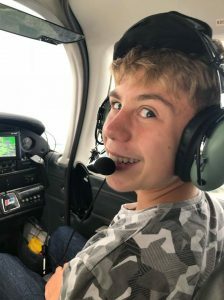 Oliver was also allowed in the aircraft with us and took the front seat, even having a minute or two of solo flying in the air before asking to hand the controls back to our pilot. We reached 1,900 feet high as anything above 2000 is commercial airspace but that was plenty high enough to admire Manchester from the air and chat with the pilot about his love for flying and plans to fly to Scotland soon. Harry started to get a little grizzly and vocal after about 30 minutes but I realised it coincided with our descent and he really didn’t want to come down. He laughed as we bumped gently back to ground and even clapped for the pilot. Non verbal certainly doesn’t mean no understanding! It was such a wonderful experience and the fact that I could share it with both of my boys when I only expected it to be me and Harry made it even more special. The siblings of children with special needs are the unsung heroes of our stories so it was great that Oliver was included too. Im sure Sir Douglas would be very proud of the work continuing in his name. I have linked to the Douglas Bader Foundation so people can check out the work that they do, see if there is a day close to you if its something you are eligible to try and to raise some awareness (and even funds) for them. Its easy to be the grateful recipient of charity days such as these without giving the charity a second thought but I know how costly these days can be so just wanted to give them a mention and I get nothing for doing that other than a warm fuzzy feeling of giving back. 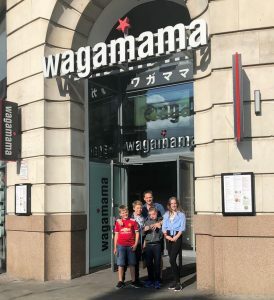 After the flight was over we decided to visit Wagamamas at the Printworks in Manchester. I’ve taken Oliver a couple of times and Andrew once but his children and Harry have never visited and we have wanted to take them for a while so it felt like the ideal opportunity. I have to admit that I was a little nervous. Harry has quite limited preferences to what he eats and wagamamas is not a bangers and mash or pizza kind of place. 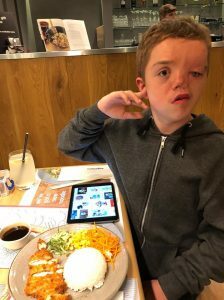 Andrews son can also sometimes be a little apprehensive with new food but I was thrilled to see him eagerly reading the menu. We all agreed that we would order our own mains but that everyone would choose one starter for every one to try (a bit like tapas I guess) and this worked really well. We did actually end up tasting each others main courses too and it was a really fun and relaxed experience. Me – Steak Bulgogi. Marinated sirloin steak and miso-fried aubergine served on a bed of soba noodles, dressed in a sesame and bulgogi sauce finished with spring onions, kimchee, half a tea-stained egg and coriander. Pad Thai is my default meal here so I took a risk with a new one and it was amazing. As a self confessed meat lover, it says a lot that I was enjoying the other ingredients just as much! Andrew – Teriyaki lamb. Grilled teriyaki lamb with mushrooms, asparagus, kale, mangetout and chilli, served on a bed of soba noodles in a pea and herb dressing and garnished with coriander. He loved it particularly as I hate lamb so its not something we have at home often. Bea – Grilled duck ramen. Tender, shredded duck splashed with citrus sauce on top of noodles in a light vegetable broth, dressed with chilli, pea shoots, spring onions and coriander. Bea really enjoyed this although she picked the chilies out as it made it a little fiery for her. She said it tasted great, was very filling and she would have it again. Harrison – Teriaki Soba. Soba noodles cooked in curry oil with mangetout, bok choi, red and spring onions, chilli and beansprouts in a teriake sauce. It was garnished with sesame seeds and coriander and he chose to add salmon. I was really impressed with this choice and he devoured it! Success! 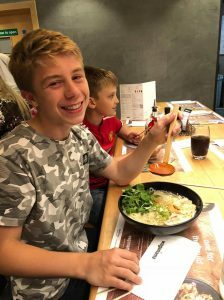 Oliver – Chicken raman. Grilled chicken on top of noodles in a rich chicken broth with dashi and miso, topped with pea shoots, menma and spring onions. I’ve never known Oliver have anything other than this dish as he absolutely loves it! Harry – Mini Chicken Katsu. Chicken breast coated in crispy panko breadcrumbs or grilled served with sticky white rice, carrots, cucumber and amai sauce. 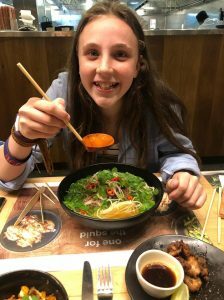 I chose this from the children’s menu and our waitress Georgina explained the dishes where the ingredients were all mixed like a stir fry and where ingredients were separate as with this dish which I thought was really helpful. 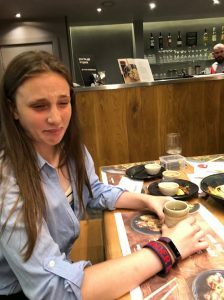 Harry really enjoyed this choice and devoured the chicken gyoza that I ordered as his starter which are 5 steamed dumplings. He couldn’t get enough of those and I’d be tempted to order more next time. I have to say that I was really impressed with the dietary needs that Wagamamas cater for. 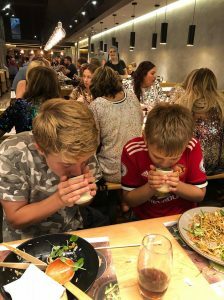 There was a great selection of vegetarian, vegan and gluten free meals to choose from and the children’s menu means that there really is something for every appetite. Wagamamas has long been a favourite restaurant for me. I love that you can see the food being cooked in the open kitchen and that it is brought to you as soon as its ready (this does mean that sometimes you get your main before the starter but that’s fine) I also love the green tea. Harrison and Bea weren’t too sure on that one which really made me laugh but its free and so it cost us nothing for them to try it and I was really glad that they did. We can’t wait to go back! All in all, a fantastic family day out for us and a great start to our summer holidays! This review was written in collaboration with Wagamamas but all views are my own. Wow!!! How amazing does this day look?! I have too, flown before i know how they feel! The food also looks so yummy, i loves beas choice. So glad you had a good day! Wow looked like an awesome day. I would love to fly… My fear of heights would stop me. Wow this looks amazing! What an incredible experience- I think I would be nervous flying. So nice that both boys got to wnjoy the amazing flight. I’m interested that even the fussy eaters enjoyed something at wagamamas. That’s the reason we’ve never been but perhaps I need to look at the menu and reconsider. This sounds like a wonderful day and I love the fact that Harry clapped for the pilot that is so sweet ad clearly shows he had the best time. 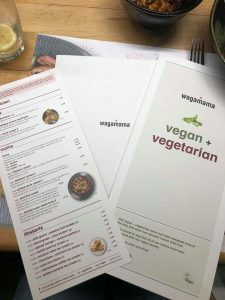 Wagammas sounds nice and I am impressed by the range of food available and the menus for everyone’s needs think we might need to try it out. This looks awesome. What a great experience!